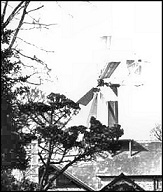 Angmering still has a windmill within the parish, and that is the disused Ecclesden Mill, situated on the west side of Highdown just above Ecclesden Manor. 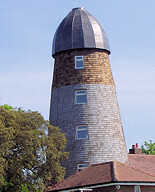 This is a brick tower-mill built in 1826 for Henry Grant, the son of James Grant, the bailiff of Ecclesden Manor who inherited the estate in 1811 from the kindly Martha Foreman.The building of this mill was at a similar time to when the old more famous Highdown Mill in Ferring that was coming to the end of her working life although ownership of the two mills was not connected. Ecclesden Mill was originally known as Highdown New Mill and was probably so-named to differentiate it from the older mill (later known as Luck's Mill) in Old Mill Lane off the High Street. 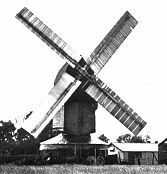 Milling ceased at Ecclesden Mill in 1872 and the sweeps (sails) were blown off in a storm in 1880. Recently she has been lovingly restored (see right) and the brickwork has been covered with wooden shingles to protect her. In the Spring of 2008, further work was undertaken with the mill being increased in height and a lead cap added. Closer to the village was a post-mill built at the beginning of the 19th Century - latterly known as Luck's Mill (see left). This was located at the bottom of Old Mill Lane (off the High Street). Millers included James Carter (1839), George Smith (1845-58), Peter West (1858-74), and the Luck family (1874-1942). It is believed that this mill originally came to Angmering from Arundel in the early-18thC although there does not seem to be any documentary evidence of this. During WW1 the sweeps were removed and the mill was powered by a gas engine. Eventually, only the brick roundhouse of the mill was left standing and that was finally demolished in 2001. 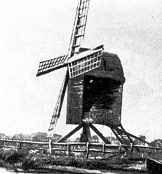 Few people, however, are aware of Angmering's fourth mill, an unusual type driven by a wind-wheel in place of conventional sweeps. This was Preston Place Mill, built by a member of the powerful Warren family of East Preston, who lived nearby at Preston Place in The Street. Built in 1853, the mill was located in the extreme south of the parish. Boundary changes in 1985 now put the location in East Preston. She was situated in Worthing Road immediately north of where the old surgery stood prior to its move to its present Sheepfold Avenue site (Willow Green). Preston Place Mill (see left) consisted of a thin wooden tower, painted dull red, surrounded by a small square outside platform, and mounted on top of a barn. The wind-wheel, consisting of eight long wooden blades set at an angle, was mounted on the tower. The wheel was turned into the wind by hand, probably by a chain winding mechanism. It is understood these mills were delivered to farms in kit form by Bury and Pollard of Southwark, London. The mill was a multi-functional device working a water-pump, a turnip-chopper and a corn-mill. So unusual was this mill that people used to walk miles in order to see her at work. She ceased working about 1916 and was dismantled by about 1930 when she had become unsafe.